The iliopsoas muscle is often involved in back and thigh pain if it is overly tight or harbors trigger points. On this page I will show you where in your body this muscle is located, what functions it has, where exactly it can send pain to, why it might have gotten tight and painful, which movements might be impaired, how to feel/palpate it and last but not least how to massage it – for your relief –. As you will relieve this muscle via self-massage, feel free to jump right now to the feel and massage part, which is where you’ll find the practical applications. Still, I recommend reading the rest of this page at some point, as it will enhance your understanding why this muscle might be troubling you. As you can see in the pictures below, the iliopsoas can give you pain in the region of your lower back and your upper thigh. 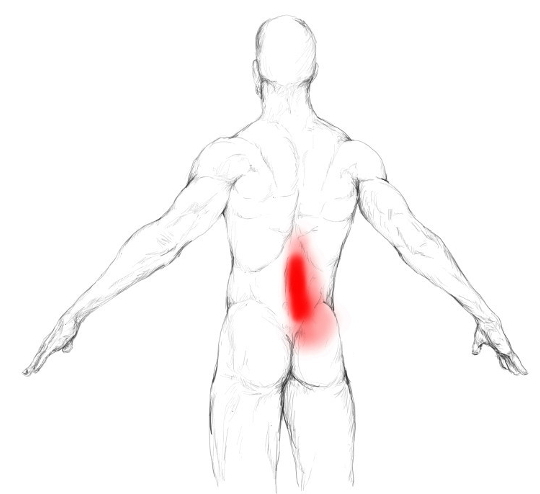 The deeper the red, the more common it is to experience pain in the respective area. But when and why does the pain occur? This is the case, if the muscle gets too tight or develops trigger points. Both are signs of overuse of the muscle and create pain. Luckily, you can get rid of this excessive tension and those trigger points by practicing self-massage. The result of a troubling iliopsoas muscle – too tight and/or trigger points – is an impaired extension of your hip, as the muscle would get stretched with that movement – remember that a flexion of the hip is its main function –. If it is too tight, it cannot extend/elongate itself properly. The motion of the movement will be limited and sometimes painful. Example: An extension of your hip occurs with every step you take when you push yourself forwards. All in all that means, walking or standing upright might become painful for you. In very severe cases, you might be even unable to walk or stand at all, and your mobility may be reduced to crawling. It goes without saying that all activities that require strong activation of the muscle, like running or doing sit ups, will be painful, too. The iliopsoas muscle actually consists of two, sometimes three muscles. Those are the iliacus, the psoas major and the psoas minor – only existent in about 50% of people –. The psoas major and the iliacus originate from different areas but fuse together at the same spot. Origins of the psoas major are the last two thoracic and all lumbar vertebrae. 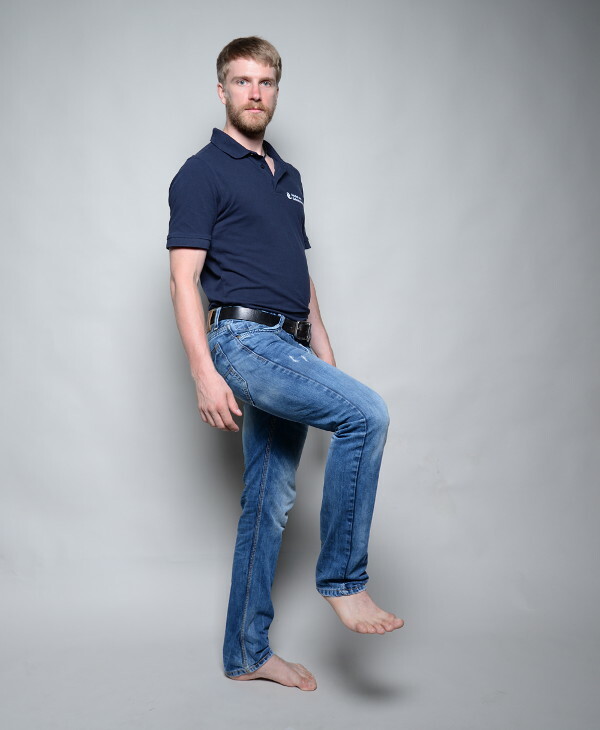 The iliacus originates from the front of your hip bones, more precisely from the iliac fossa. Together they attach at the inner side of your thigh bone – at the lesser trochantor –. The psoas minor, if present, runs from your last thoracic and first lumbar vertebrae to your pubic bone. The most important function of this muscle is the flexion at your hip. Thus, it is active when you are doing sit ups, walk, run or climb stairs. Further functions are discussed, but there is lots of disagreement. As this is not the place for a detailed anatomy course but to get a basic idea about this muscle’s function, we can happily disregard those “discussed further functions”. It will be more interesting to see where in your body this muscle can create pain. Above, you already read that overuse of the iliopsoas results in excessive muscle tension and trigger points. Now we are going to examine a little bit more specific what I mean with overload and overuse, respectively. Generally spoken, you overload or abuse muscles by using them hard or very little – sedentary lifestyle –. I discussed the principle of overuse in my article on muscle and joint pain causes. In case of the iliopsoas muscle, that means the following movements, motions and postures can overload it, and in turn create trigger points as well as excessive tension. The result will be pain. In this case back and/or thigh pain. Sitting hours long – in the car or at the desk –. Due to the flexion of your hip while sitting, the muscle is permanently shortened. Finding your iliopsoas muscle and checking it for tenderness is actually not as hard as many believe, still it is not an easy task. Just give it a try. As long as you go slow you will be fine. All you have to do, is to make yourself comfortable, take some time and apply the following instructions. We will start with feeling the psoas major and continue with the iliacus. I will spare out the psoas minor as you will palpate it anyway together with the major. Lay down on the floor and draw up both knees. Now let them fall to the opposite site of the iliopsoas you want to work on. That means, if you want to check your right iliopsoas muscle for tenderness, let your knees fall to the left – picture below –. Place your fingers right next to your bellybutton and contract your abs. You can do so by simply doing a mini crunch or by lifting your head and looking at your fingers. Keep your abs tight and move your hands slightly to the right until you are in their midsection. Now you have to loosen them again and keep them relaxed as your goal will be to feel your iliopsoas muscle right through your abs. Start to press with your fingers slowly into your abdominal region. Go as deep as possible – a couple of centimeters – without pushing yourself too hard. Then move your fingers to the left, towards your spine. Now you are on your psoas major muscle. Your ability to already feel this muscle, is mostly dependent on how tight it is. If it is very tight, you might experience unbearable pain when just slightly touching it. In that case, you know you are on it and that you need to release/massage it. On the other hand, if it is not extremely tight, you can feel it by flexing your hip – pulling your knee towards your chest –. Here, a tiny movement is enough. By doing so, you will feel it contracting. From there you can palpate the whole muscle, which spans from just below your ribs to the region of your groin – down there you will mainly feel the muscle’s tendon –. Feeling the iliacus might be a bit tricky. Still, you should not worry too much, as it is easy to locate the right spot for your massage. Just position yourself as you did already with the palpation of your psoas major. Move your fingers from your bellybutton sideways until you hit the upper part of your hip bone – ASIS – . For massage, you will use the finger-technique. You are basically getting into the position that you used for feeling the muscle. As soon as you found it, start searching for tender spots. When you encounter one, stay in this area and massage it with maximal 15 slow and very short strokes. Focus your massage only on the painful spot. Afterwards, move on to the next tender location or the next muscle on your to do list. For massage you can use your fingertips and support them with your other hand, or you use your hands “back to back”. I personally use my hands “back-to-back” when massaging the psoas major and my supported fingertips when working my iliacus. 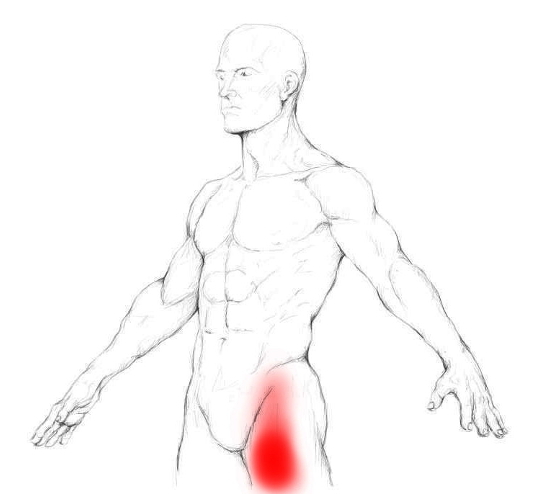 The tenderest and most painful spots on the iliopsoas muscle, and thus the ones to focus on, you are likely to encounter right next to your bellybutton, on the lower third and the outside of the front side of your hip, and last but not least down on the muscle short before the it merges into its tendon. Also see the muscle picture for the localization of these points. Note: When you are massaging the lower part of your iliopsoas muscle, make sure to double check if you are on it by flexing slightly your hip – pulling the knee towards the chest –. You should then feel the tendon or the muscle contracting. If you don’t, you are not on the muscle and should make sure to get back on track. Usually, you do not need to massage this area because massage of the upper part of iliopsoas muscle relieves the tension on its lower part. Still, you might feel different and need to work on that area. Important information for lasting relief. If you successfully work the iliopsoas muscle but your pain relief is only transient, it might be that your quadratus lumborum muscle is causing the trouble. It is possible that the iliopsoas develops satellite trigger points due to trigger points in your quadratus lumborum. If that’s the case, you need to relieve this muscle, too. Otherwise, the work on your iliopsoas alone won’t bring the desired results.